tadapi tava gunānām īsha pāram na yāti. 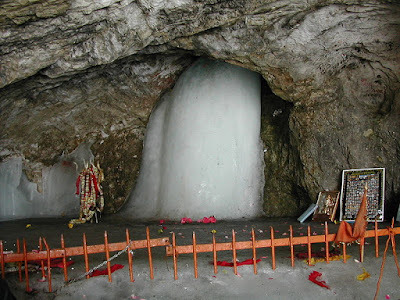 I have lived with a picture of the Amarnath ice lingam on my wall for many years, and though I am a seasoned traveler and have made it a point to visit all the major places of pilgrimage in India, I never went to Kashmir. I thought a journey to Amarnath was beyond my reach, at least in this lifetime. The trek to the holy cave is strenuous and the political situation in Kashmir is mostly unstable. Last April, my friend George called to let me know that he and his artist-partner Claudia were going to Kashmir and planned to visit Amarnath. I immediately expressed my concern on the difficulty of this journey, reminding him of his health problems. “We’ll take a helicopter,” said George and laughed. When he mentioned ‘helicopter’ a spark went off in my head. I saw a green signal as it were, a possibility for me to visit the Lord at Amarnath. “I’m coming with you,” I said. This was my chance of a lifetime. “Of course,” was George’s immediate reply. George was familiar with Kashmir having lived there for many years as a disciple and personal attendant to the well-known Shaivacharya Swami Lakshmanjoo. Moreover, he had all the contacts necessary to enroll me in the 2016 Sri Amarnath Yatra. To me, Kashmir is the land of God, the land of Shiva – the land of learning, philosophy, poetry, music and art. 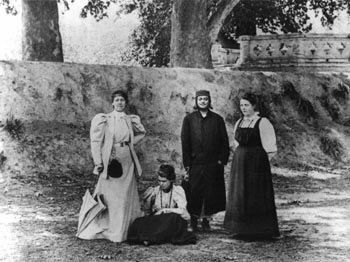 Swami Vivekananda in one of his letters called the Kashmir Valley “Paradise on Earth.” After reading Sister Nivedita’s The Master as I Saw Him, I had always longed to visit Kashmir and Amarnath. 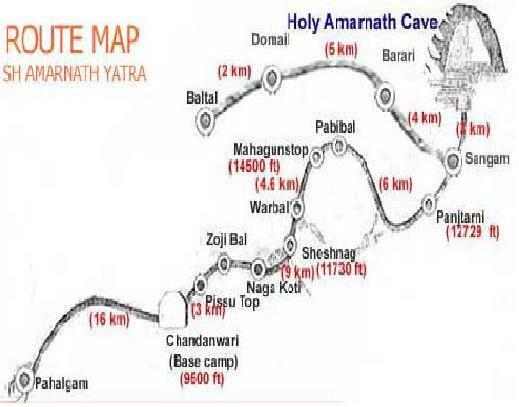 There is some controversy about the discovery of the holy cave of Amarnath. Some say that this cave has been a Hindu destination of pilgrimage for thousands of years being mentioned in the ancient Kashmiri Sanskrit text Rajatarangini, while others say that this cave had been discovered not that many generations ago by a Muslim shepherd named Malik. 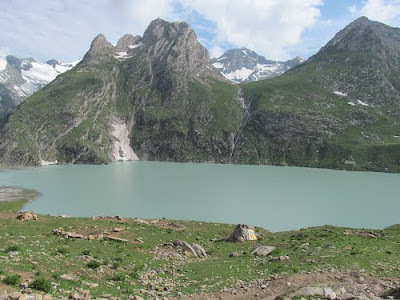 The valley of Kashmir, according to Hindu epics, was a big lake in ancient times. Kashyap Rishi drained the water through a number of rivers and rivulets. Soon after, Bhrigu Rishi came on pilgrimage to the Himalayas and was the first to have darshan of the holy cave of Amarnath. So many stories are attributed to this cave. Ma Parvati asked Lord Shiva when and why he started wearing the munda mala (garland of skulls). “Whenever you die, I add more heads to my mala,” replied Lord Shiva. “Please tell me the reason why I die again and again but you are immortal,” asked Ma Parvati. “If you want to know the secret of immortality, you will have to listen to the Amar Katha,” said Shiva. He took Ma Parvati to a lonely place where no living being could overhear him tell this ‘secret of secrets’ and ultimately chose Amarnath Cave. Shiva left Nandi at Pahalgam and released the crescent moon he carries on his forehead at Chandanwari. At the banks of Lake Sheshnag, Shiva released the snakes, left his son Ganesha at Mahagunas Parvat, and at Panchtarni, he left the life-giving Five Elements (earth, water, fire, air and ether). After leaving all these behind, Lord Shiva entered the holy Amarnath cave and revealed the secret of immortality to Ma Parvati. Nothing is perfect even in the world of Gods. Lord Shiva took so many precautions to keep anyone other than Ma Parvati from hearing the secret of immortality, yet by chance, a pair of white pigeons dwelling in the cave overheard the secret and became immortal. To this day, pilgrims visiting Amarnath often report having seen a pair of white pigeons in the cave. I booked my airline tickets for India and planned to arrive in Srinagar on Saturday, July 16. George had already booked a helicopter to take us to Amarnath on July 19 which happened to be Guru Purnima. 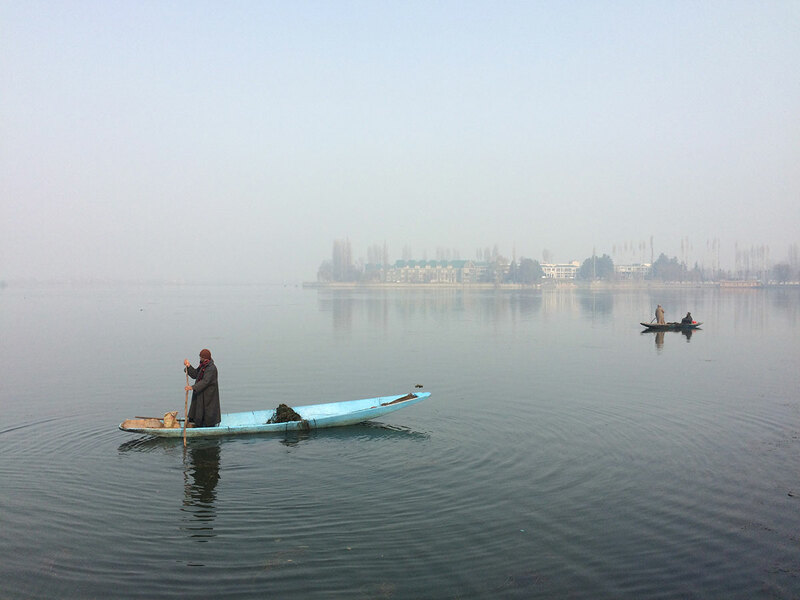 Envisioning the trip to Kashmir, my heart was filled with anticipation. Beside George and Claudia, my dear friends John and Denise Hughes and their daughter Shanna were also going to be in Srinagar. They are all Swami Lakshmanjoo’s close disciples who, after the master’s passing, founded the Kashmir Shaiva Fellowship in Los Angeles. They have dedicated their lives to translating and publishing books of Swami Lakshmanjoo’s teachings on Kashmir Shaivism. I happily accepted when they invited me to stay at Swami Lakshmanjoo’s ashram in Srinagar. Everything was perfect until the night before I left Laguna Beach for India. My friend Sangeeta called me and told me that the Amarnath yatra was stopped, and Kashmir was under curfew after violent protests in the wake of the killing of a militant commander and his associates. Everything was uncertain. Would I be able to fly into Srinagar, and would we be able to proceed to Amarnath? I questioned whether to stay in the U.S. or proceed with my India itinerary. I’m glad that the call to Amarnath proved stronger than the hesitation in my brain. After arriving at the Delhi airport, I was waiting for my connecting flight to Srinagar when Shanna unexpectedly appeared. It was a relief to be on the same flight. Shanna is a strong woman who spent her childhood in Srinagar. Two policemen backed off from stopping us exiting the Srinagar airport when Shanna replied to their inquiries in fluent Kashmiri. It was a bit like a high-speed race you see in the movies as the taxi driver expertly maneuvered past rocks and razor-sharp concertina wire on the road. All shops on both sides of the road were closed, and the only people on the road were military and men throwing rocks at them. 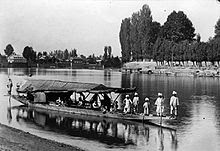 Though it was an eerie scene, nothing could take away the beauty of Srinagar with its majestic mountains and timeless, serene-looking Dal Lake. We passed many soldiers, and curiously enough, one vendor pushing an ice-cream cart. Then, just when we were about to be stopped by soldiers, the driver turned into a small lane. We had arrived at Swami Lakshmanjoo’s ashram. I love this teaching because it reminds me of Swami Vivekananda. Sri Ramakrishna predicted that Naren would no longer hold on to his body when he remembered who he really was. When Swami Vivekananda went to Amarnath and saw Lord Shiva in his full glory, he became transformed. He remembered. I thought of Sri Ramakrishna. He also did not follow a fixed program or planned lectures. Nobody could predict what he would do next or when he would go into samadhi. Not knowing what else to do, I sat down cross-legged in the large living room, and my mother sat down on the couch behind me. Swami Lakshmanjoo slowly entered the living room. Using a cane to support himself, he walked to a couch on the other side of the room. He sat down facing us. Though he looked old and frail, he was strikingly handsome. He wore a brace around his neck. Without moving or saying a word, he sat on the couch looking at us for the longest time. Just when I thought that he would never talk, Swami Lakshmanjoo said something to a devotee sitting next to a harmonium. Promptly kirtan began, and sweet sounds of devotion reverberated in the room. Then something happened that I will never forget. Swami Lakshmanjoo began to look animated, and suddenly, he tore off the neck brace with one swooping motion. He sat for a while, and then abruptly, he tossed his cane into a corner and got up. With arms upraised, Swami Lakshmanjoo started to dance. Keeping rhythm with the bhajan, he put full weight on each foot as he danced. Then he stopped before a devotee that stood near him. 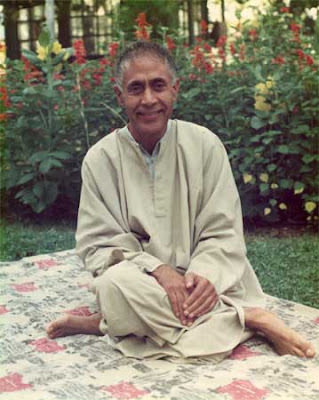 Swami Lakshmanjoo bent down and clapped his hands in front of the man’s knees, and clapping again and again, he moved up from the man’s knees to his head. He turned and danced again with vigor. One by one, he stopped at people in the room clapping his hands from their knees to their head. I had never seen anything like that. As the Swami danced closer to where I was sitting, I was wondering if I, too, who was just an observer, would get this treatment. When Swami Lakshmanjoo danced before me, I forgot to think, forgot who I was and everything else. His eyes looked blue and deep like the mountain lakes I had seen in the Austrian Alps. His face emanated ecstatic joy as tears flowed down his cheeks. I barely remember that Swami Lakshmanjoo touched my hands prompting me to stand up. My body flew up from a seated position as if it were a feather. I watched him clap his hands in front of me, and when he moved to the next person, I sat back down dumbfounded. That day, I was rather proud of my mother. Even though she had been a devout Catholic all her life, she was open enough to appreciate Swami Lakshmanjoo’s ecstatic behavior. 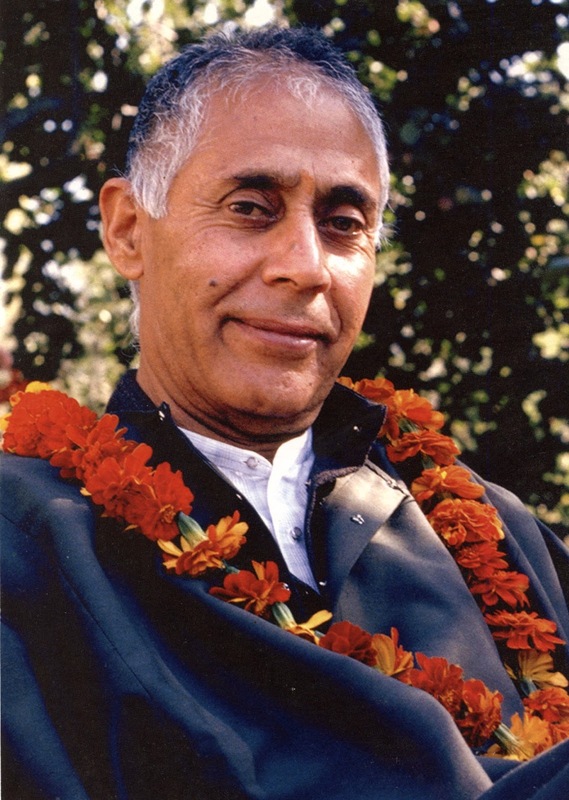 Swami Lakshmanjoo lost the ability to walk soon after the day of the dance, and he left his mortal body a few months later in New Delhi at the age of 84. Many years passed since 1991 and my arrival in Srinagar on July 16, 2016. I had seen photographs and videos of Swami Lakshmanjoo at his ashram in Srinagar and often thought that I’d like to visit. Now I was here but at a most inconvenient time. Though the ashram atmosphere was spiritual and peaceful, there was turmoil outside. The people of Kashmir were suffering: curfew – no traveling on the streets, no phone connections, no internet connections. Only limited food and medical supplies could be obtained. ATMs were running out of money, and garbage was piling up. The next day, on July 17, things looked especially grim. Listening to an old, battery-operated transistor radio, we got the news that thousands of pilgrims on their way to Amarnath were stopped in Jammu. The road via Anantnag was too dangerous for travel. Many people had been killed due to unrest. According to our itinerary, we would have to leave for Pahalgam on this day to be in time to catch the helicopter for Panchtarni early morning on July 19, Guru Purnima. To make things worse, George had developed a very bad cough, and I was wondering whether he would be fit enough to travel. I felt confident that everything was going to be alright when we left Srinagar for Pahalgam around 10:30 pm. Driving during the day was not possible because of the curfew. In the dark car, George’s iPad dimly lit Claudia’s face as she searched for a file. I could hear Swami Lakshmanjoo chanting a sloka when I started chanting the Hanuman Chalisa, asking Hanumanji for protection. I always do that before going on a trip. When we turned north onto Highway 501 leading to Pahalgam, the streets were deserted, and we came across very few cars. We saw razor-sharp barbed wire, rocks on the road, and periodically, we saw soldiers standing in groups. We were stopped a few times, and soldiers carrying rifles peeked into the car through the windows. When we told them that we are on a yatra to Amarnath, they let us proceed. In August 2000 about 32 people including Amarnath pilgrims and police officers were killed in Pahalgam during a terrorist attack. As a consequence, we had to get out of the car at a checkpoint just before reaching Pahalgam. Our luggage went through X-ray and everybody was searched for guns and other weapons. Nobody seemed to mind being frisked. We arrived at our hotel around 2:30 am, and though I was very tired, I could not help but notice how charming and clean our room was. In the morning when I stepped out of the room and onto the veranda, I was greeted by crisp, fresh air and a breathtaking view of high mountains covered with pine forests. Looking past the hotel’s meticulously-kept green lawn and beautiful willow trees, I could see the Lidder river and hear its roar as it rushed through the valley. At breakfast I noticed that we were the only guests in the entire hotel. While the others moved about a bit, I spent most of the day sitting on the veranda in front of our room and staring at a majestic mountain in the distance. Time passed. I listened to my head arguing with my heart. Om Namah Shivaya! Here I was in Pahalgam. Om Namah Shivaya! My brain said: “After all these years avoiding Kashmir and its political conflicts, I had to come during a most dangerous time.” Om Namah Shivaya! My heart said, “This is the right time; this is when I am supposed to be here.” Om Namah Shivaya! “Spiritual power often manifests strongly during conflict.” Om Namah Shivaya! “The Bhagavad Gita was not spoken during a time of peace.” Om Namah Shivaya! Om Namah Shivaya! Om Namah Shivaya! I watched a helicopter flying in the direction of the beautiful mountain I had been staring at and felt a tremendous longing to see Lord Shiva at Amarnath. Pahalgam, at 7,000 feet, is the base camp for the annual yatra to the Sri Amarnathji cave shrine. The yatra trek runs along the river to Chandanwari, and from there, the trek becomes steep and is accessible only by foot or pony. One has to climb to Pissu Top and then trek to the mountain lake of Sheshnag which is close to 12,000 feet high. From Sheshnag one has to climb a steep height across the 14,000-foot Mahagunas Pass and then descend to the meadowland of Panchtarni. At the foot of Bhairav Mount, there are five rivers that flow at Panchtarni. Many pilgrims bathe in these five rivers before trekking the last four miles to the holy cave of Amarnath which is situated at 13,000 feet. Altogether the trek from Pahalgam to Amarnath is 31 miles long and takes most pilgrims three days to complete. There is a shorter route via Sonamarg and Baltal, Domail and Barari Marg which is only 9 miles long. However, few pilgrims are fit enough to trek this route because it is extremely steep and dangerous. Swami Vivekananda tried to get to Amarnath via Sonamarg but had to turn back due to bad weather and landslides. This turned out to be fortunate for Sister Nivedita because Swami Vivekananda let her join him on the pilgrimage to Amarnath via the Pahalgam/Chandanwari route. At my age, I could not have undertaken the three-day trek, and my only option to see the Lord at Amarnath was to take a helicopter. We got to the helicopter pad early on the morning of Guru Purnima. A few people were ahead of us, and we watched as they boarded a helicopter. Six people besides the pilot can be seated in the helicopter. When it became our turn, we had to split up. George and I boarded the first helicopter. I thought the helicopter ride would be scary, but on the contrary, it was exhilarating and beautiful. I looked down at the pine trees and then watched as we flew past glaciers of eternal ice. 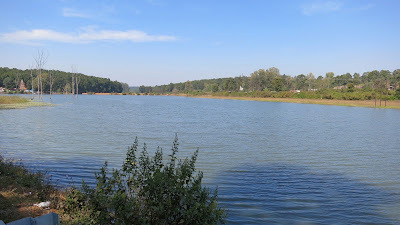 I saw the beautiful, translucent blue Sheshnag Lake sparkling like a rare jewel faceted between snow-peaked mountains. Soon after, we landed at the helipad at Panchtarni. Somehow, deep in my heart, I always knew that I had to make this journey alone – at least the last leg of it. I passed the security area around the helipad and started to walk along a muddy path. It had rained a lot over the past few days, and the mud was deep and stuck to my shoes. Soon I was surrounded by many men who all offered their services to take me to Amarnath. I looked around. All the way up one mountain were men waiting with their horses for pilgrim customers. Palki wallahs were sitting around waiting to be hired by pilgrims who never came. These men are all Muslims who depend on Hindu pilgrims to hire them. Money earned during the Amarnath yatra season helps them to get by during the harsh winter. One old man agreed to take me to the cave for Rs 1,200 - a fair price according to the Amarnath Yatra Shrine Board. He whistled and motioned up the mountain until a young boy brought a white horse to where we were standing. I was glad to see that the horse was not too tall. Just as I was contemplating how I should approach getting up on the horse, I was expertly hoisted up into the saddle by the old man and the young boy. “Auntie,” said the boy. “Give me your bag. I’ll carry it for you.” I was grateful. This way I could hold on to the saddle with both hands. With steady gait, the boy began to walk up the muddy path, expertly leading the horse past rocks. There were only a few people on the path to Amarnath. I saw one sadhu clad in gerua walking barefoot. He had one bad leg and was limping, but that did not stop him from briskly walking on. Once in a while pilgrims returning from the holy cave greeted me with a hearty “Jai Bole!” or “Har Har Mahadev!” I saw three middle-aged Indian ladies dressed in kurtas panting for breath. They did not stop walking, and with each step, they said, “Jai Shiva!” I saw smiling faces, and I saw exhausted faces. At almost every turn of the path, I saw soldiers sitting or standing, keeping watch. The path was steep. Looking down, I saw a river with milky blue water flowing about 1,000 feet below. The boy was leading the horse with great confidence, and I wasn’t worried that the horse may slip even when we passed a difficult rocky terrain. I was thankful. This boy and this horse were taking me to Lord Shiva. In retrospect, I wish I could remember this Muslim boy’s name. He became very dear to me. When we reached Sangam, a Jammu & Kashmir police officer stopped us. “You have to get off the horse here and walk the rest of the way,” he said to me in perfect English. It was still a walk of almost two miles to the cave - mostly over ice and slippery terrain. I asked the officer to please let me continue riding the horse a bit further. The officer was adamant. “No, everybody has to get off their horses here,” he said. Suddenly, seemingly out of nowhere, a man appeared in army fatigues and started arguing with the police officer. “She is a special guest of the Indian army,” he told the police officer. They argued for quite a while. At last, the police officer gave me permission to continue, and the boy, the horse and I resumed our journey toward Amarnath. Walking slowly over snow-covered mud and ice, the horse carefully avoided holes in the ice. Some holes were so big that you could see a river flowing underneath. We passed a big rock next to the river, and I was wondering whether this was the place where Swami Vivekananda bathed before entering the holy cave. Soon after, multi-colored tents that pilgrims can rent as well as army and police tents lined the path. At one tent, we were stopped again, and a man said something in Hindi about a ‘mobile and camera’. Luckily, I didn’t understand him and kept my mobile and camera. We arrived at the steps leading to the holy cave. The boy helped me get off the horse and said, “Auntie, I’ll wait here for you.” I started walking up a few steps and soon became aware of the high altitude. I stopped, caught my breath and walked up another few steps. I was glad to see that I was not the only one who had to rest. Even younger people than me had to stop for a while. About half way up, there was a tent where pilgrims left their shoes. The steps didn’t feel cold at all as I continued barefoot. The last long flight of steps seemed the hardest. There were pilgrims holding on to the railing while others sat on the steps to catch their breath. The cave was near, and though I was out of breath, I pushed on, driven by longing and adrenaline. As soon as I reached the level walkway inside the holy cave, I felt completely overwhelmed. The combination of exhaustion, high altitude, shortness of breath and intense emotion as I was imbibing the sheer power of the place made me stop. There were only a few more steps up to the ice lingam, but I had to sit down. It couldn’t have been more intense if I had walked straight into Lord Shiva’s arms. Tears were rolling down from the corners of my eyes as I sat by myself on a green wooden bench in the cave. A policeman walked by, looking at me as I sat there helplessly overcome with feeling. I don’t remember how long I sat there. Finally, I composed myself and took out the bag with cashews and raisins I had brought from America as an offering for Lord Shiva. There remained only a few steps up through a brass gate, and I was before the Lord. The ice lingam had melted quite a bit and only one-third still remained. It did not matter to me that the ice lingam was not high. My heart was so full. I think if the divine vibration in the cave would have been any stronger, I would have fainted. I handed the bag of cashews and raisins to one tall, young priest for offering. For a moment I thought that the priest might not give me enough prasadam to bring back to all the devotees in the U.S. I reached past a few people to get the attention of the priest. When I failed to get his attention, I took out my mobile and showed the priest a photo of our Sri Ma Dakshineswari Kali of Laguna Beach. All of a sudden, there was a huge commotion. Everybody wanted to see Ma. I held my mobile high so that all the people could see Ma and suddenly realized that I was holding it up to show Lord Shiva in the ice lingam. Again, I got overwhelmed and had to go back down the steps and sit on the bench to compose myself. The priest came down the steps to hand me the prasadam that I had forgotten. Another priest came and filled my arms with more prasadam and put holy bhasma on my forehead. The policeman came and put wooden shoes on my feet. “You must be cold,” he said. An old man carrying a small bucket used a ladle to pour maha-prasadam – hot payesh with lots of saffron - into a paper cup and handed it to me. So much love, so much kindness. The Amarnath Cave is very high and wide but not as deep as I had imagined. Some pigeons were flying high in the cave. I was still sitting on the bench and felt a bit self-conscious for having shown so much emotion. Then I remembered that even Swami Gambhirananda, the 11th President of the Ramakrishna Order, became emotional when he visited Amarnath. President Maharaj, Swami Atmasthananda, had once told me that Swami Gambhirananda, who was usually very reticent talking about his spiritual experiences, said that he saw Thakur Ramakrishna seated in the ice lingam. When my friends arrived in the holy cave, they also got wooden shoes to wear as they walked up the steps to the shrine of the ice lingam. Wooden shoes are the only footwear allowed in the cave, and the priests, police and staff who have to stand on the cold ground for a long time wear these shoes. There are three ice lingams in the cave. The large ice lingam is worshiped as Lord Shiva. The ice lingam next to Lord Shiva is worshiped as Ma Parvati and next to Ma is Ganesha. The area is protected by a grill, most probably to prevent devotees tossing items at the lingams. I noticed that George did not look well. He looked intently at the ice lingam, and then he and Claudia chanted the aghora mantra for quite some time. More people started to come into the inner cave, and the friendly priest gestured for us to move. At least two hours must have passed since I first entered the holy cave. I could never have stayed this long during normal times. The problems in Kashmir prevented most pilgrims from reaching Amarnath. On peak days, I was told, there is a long line of devotees standing on the steps, and it is not unusual for them to wait for two hours before they can have darshan of the ice lingam for just a minute. The most auspicious time for the Amarnath yatra is the month of Shravan which starts with the full moon in July – Guru Purnima – and ends with the full moon in August – Rakhi (Shravan) Purnima. On our way down from the holy cave, one old sadhu unexpectedly stopped George. “Your knees are not good,” he said, and with a quick gesture, he vigorously rubbed George’s knees. “Knees are okay now!” said the sadhu and quickly disappeared. George told me later that, in fact, a lingering pain in his knees subsided after the incident with the sadhu. We walked to the end of the steps and stopped at a tent where people were eating. There is no charge for food at Amarnath, though one may leave a donation. My mind was flying high, and I did not feel like eating. I stood at the tent entrance looking up at Amarnath when I heard a voice next to me. “Auntie, I am looking for you,” said the Muslim boy who brought me in on the horse. “Come quickly. It will rain.” I waved to the others and followed the boy. He carefully took my hand lest I should fall on the slippery path. When the path got steeper, he stopped at a stall selling trinkets and said, “Auntie, wait here. I’ll bring the horse.” I watched the Muslim shopkeeper cover trinkets, Hindu deities and prasadam he had displayed for sale with a plastic cloth. It started to rain a bit. The shopkeeper motioned to me. “Come stand under my tent and put your bag on the table so it won’t get wet,” the shopkeeper said with a friendly smile. The boy appeared with the horse, and I made a sad attempt to get into the saddle. “Auntie jump,” said the boy. The shopkeeper kindly helped to hoist me onto the horse and tucked in my plastic raincoat around the saddle. The weather was changing rapidly as we started on our way back to Panchtarni. A strong wind had picked up and the rain felt sharp on my face, but I experienced too much joy to feel cold. Steady and unperturbed, the young boy walked through mud and ice, perfectly guiding the horse back to Panchtarni. The innocent, loving kindness this boy had bestowed on me touched me deeply. I felt that he was my family, and I was not just a rhetorical aunt. I wanted to make him happy and all I had to give was my gratitude and some money. I handed him a nice tip of Rs 500 note as a gift before I got off the horse in Panchtarni. He held the money and looked perplexed. “Oh no, auntie,” he said. At this point, the old man who owned the horse appeared and I paid him the agreed amount of Rs 1,200. The boy was still holding the Rs 500 note, not knowing what to do. When I put the note into his shirt pocket and said, “Dakshina,” I was rewarded with a smile I shall treasure for a long time. I realized that George was quite ill when he reached Panchtarni. He had high fever, and his cough sounded worse. It was cold and raining heavily. We needed to get him back to the hotel in Pahalgam as soon as possible. Though there were quite a few people in front of us waiting for a helicopter, people at the helipad put George on the next helicopter. Claudia and I were lucky to get on the last helicopter to Pahalgam for the day, and we got to sit in front next to the pilot. The most amazing scene presented itself right in front of my eyes – to the left and to the right were majestic mountains, silent witnesses of Lord Shiva’s glory. I wished I could have made myself very large, so large that I could have spread my arms and embrace these beautiful mountains clad in eternal ice. We stayed in Pahalgam for three days waiting for George to get well enough for the return journey to Srinagar. Due to the curfew, I stayed in the hotel and had ample time to reflect. This area of Kashmir is predominantly Muslim. I thought of the cooperation between Hindus and Muslims I had witnessed at Amarnath and wondered if this would be possible in all of Kashmir. The way the manager talked about suffering touched me. He had the stoic expression of someone who is used to suffering. I learned that the distinguished man who served us meals so attentively was not a waiter at all. He was a professional trekker but had no clients. He told me of a French man he trekked with. “He had a large camera and wanted to take pictures of the Pahalgam Ramakrishna Ashram,” said the trekker. “You have to hike up the mountain for about an hour or so or take a pony. Nobody lives there; it’s mostly a big rock with writing on it.” I wondered if this rock relates to Swami Vivekananda’s travels in the region. Hindu pilgrims visiting the holy shrines of Vaishno Devi and Amarnath have a significant impact on Kashmir’s economy, but Kashmir’s troubles are not only of an economic nature. They are complex. There are political clashes: Kashmir is a disputed territory administered by three countries – India, Pakistan and the People’s Republic of China. There are clashes by separatists who want Kashmir to be autonomous. There are religious clashes: Kashmir is an important region for Hindus, Muslims and Buddhists. And to add intensity, self-interested parties instill hatred in good peoples’ hearts. As a result, senseless violence kills too many individuals who could have lived productive lives. One thing all people in Kashmir have in common, whether they are the security forces, the militants or the general public who live there: they are all suffering. The taxi that took us back to Srinagar had a broken rear window. It was a new Toyota, and I was curious how the window got broken. The driver explained that a man standing on the street threw a rock at his car because he was driving Hindu pilgrims. Most Amarnath pilgrims leaving Pahalgam joined a military convoy to take them down the mountain over dangerous roads. We passed a long line of taxis and felt sad that people had to take such precautions. My heart goes out to the Kashmiri people who are stuck between warring parties, who just want to go on with their normal lives and who suffer with seemingly no end in sight. My empathy goes to all the disappointed pilgrims who were stopped and could not proceed to the holy cave of Amarnath. I am also sorry that I was not able to visit the Ramakrishna Mission due to the curfew in Srinagar. I pray to Sri Ramakrishna to turn hatred into respect and understanding and bring peace and harmony to the beautiful but troubled region of Kashmir. “Please fasten your seatbelts,” said a flight attendant over the PA system. “We’ll be landing shortly at Swami Vivekananda International Airport in Raipur.” Wow! 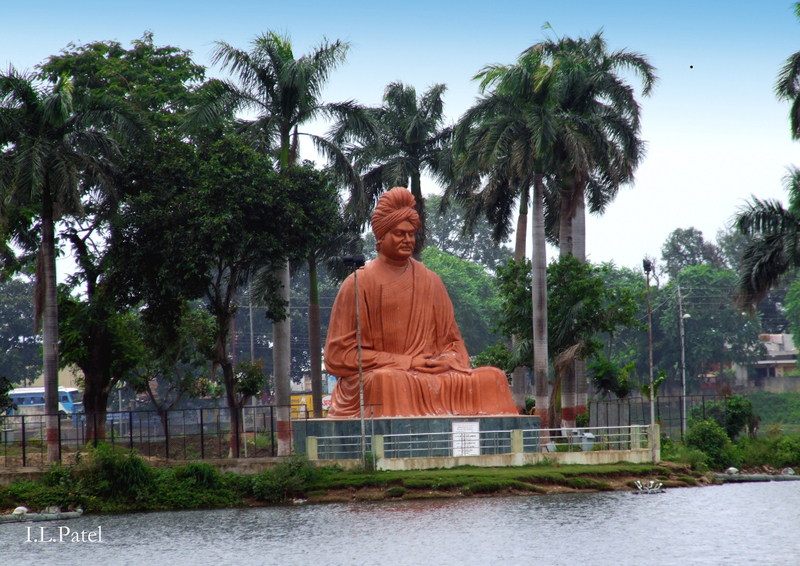 I was amazed to hear that the city of Raipur named their airport after Swami Vivekananda. Swamiji lived in Raipur from 1877 to 1879 when his father Viswanath Dutta, an attorney at the Kolkata High Court, was transferred there. At that time, there were no good schools in Raipur, and the fourteen-year-old Naren (who later became the famous Swami Vivekananda) spent time at home learning from his father and discussing spiritual topics. I remembered a story I had read about young Naren traveling in the countryside near Raipur in a bullock cart when the sight of a large bee hive caused him to go into a deep spiritual ecstasy. People in Raipur are proud that India’s national hero lived there for two years. Besides naming their airport after Swamiji, they also erected a gigantic statue of Swamiji sitting in meditation pose, overlooking a lake in the heart of the city. Some say that the years Swamiji spent in Raipur were a turning point in his spiritual life. Raipur is the capital city of the recently created state Chhattisgarh. This land of Chhattisgarh and Madhya Pradesh was made sacred by the feet of Lord Ram, Sita and Lakshman who lived and walked through these forests after being banished from their royal palace in Ayodhya. It is a land I’ve wanted to visit for a long time. When I boarded the Chhattisgarh Sampark Kranti Express in Raipur, my heart was filled with anticipation. I took a seat next to the window. Soon after the train left the station, the landscape changed from industrial to rural. Gently rocked by the movement of the train, my mind was entranced by the landscape of meadows, forests, streams and lush, green hills. The scenery was so beautiful. I imagined Lord Ram and Lakshman walking through this forest collecting wood while Sita Devi, wading in the shallow water of a crystal-clear stream, washed berries and fruit she had collected. I also imagined forest dwellers coming by and humbly offering their service. Surely, the royals had a lot to learn from them about how to survive and sustain themselves in the jungle. My daydream broke when it was time to get off at Pendra Road. I was on my way to Amarkantak, the sacred mountain where gods, saints, rishis and every-day pilgrims come to do tapasya. Swami Viswatmananda, head of the Ramakrishna Kutir Amarkantak, had sent a jeep with a driver to pick me up at the station. We drove along a narrow country road up steep inclines and through a dense forest that is home to monkeys, bears, tigers and other wild animals. We made our way around sharp hairpin curves, and when we reached the plateau, I got my first glimpse of the holy river Narmada. It is said that you need to take a bath in the Ganga in order to become purified, but you only need to look at the Narmada for all your sins to fly away. My heart was leaping with joy, filled with contentment. There was nothing I wanted more at the moment than to breathe in this spiritual atmosphere. The driver opened an iron gate and parked the car in front of the temple at the Ramakrishna Kutir ashrama. I climbed up the steps to the shrine room to bow to Sri Ramakrishna, Holy Mother and Swamiji. Ramakrishna Kutir was started by Swami Atmananda, a charismatic monk of the Ramakrishna Order, and dedicated in 1979 by Swami Gambhirananda, the 11th president of the Order. 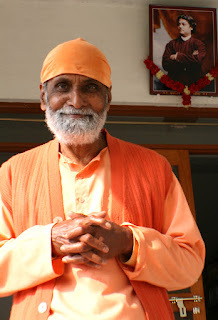 Inspired by Swami Atmananda, Swami Viswatmananda - this is his proper name but everybody calls him Jayram Maharaj - has lovingly taken care of this ashram for the past 36 years. Over the next few days I visited the Narmada Kund and several other ancient, holy places. I felt carefree and happy. And then something happened that started to turn my Western cultural understanding upside down. Lord Shiva showed me His bleeding heart as it were. 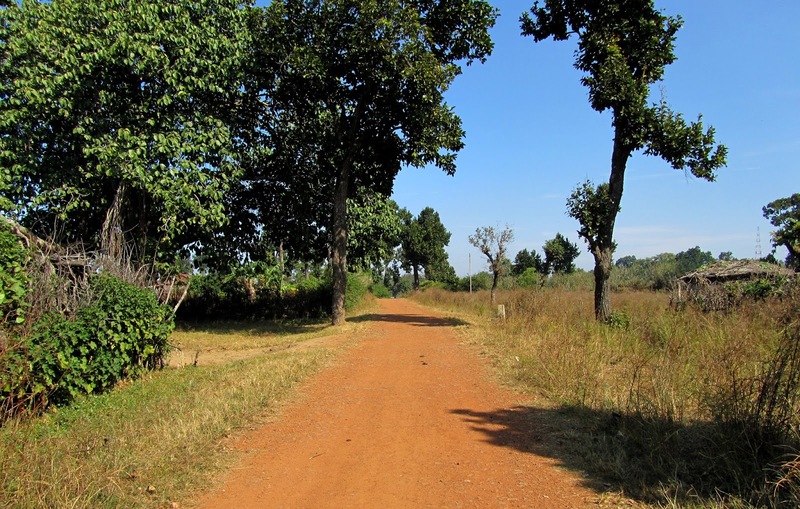 The Ramakrishna Kutir is located in the tribal area of Amarkantak, and there is a school for tribal children nearby. Every afternoon hordes of tribal children come to the ashram to play and pester Jayram Maharaj for “lozenges” (candies). They have no shoes, and their school uniforms are shabby. Girls wear a white blouse and blue frock, and boys wear a whitish shirt and blue half pants. When it gets cold in Amarkantak, Jayram Maharaj opens up his storage room to teachers from the tribal school who hand out sweaters to the children. 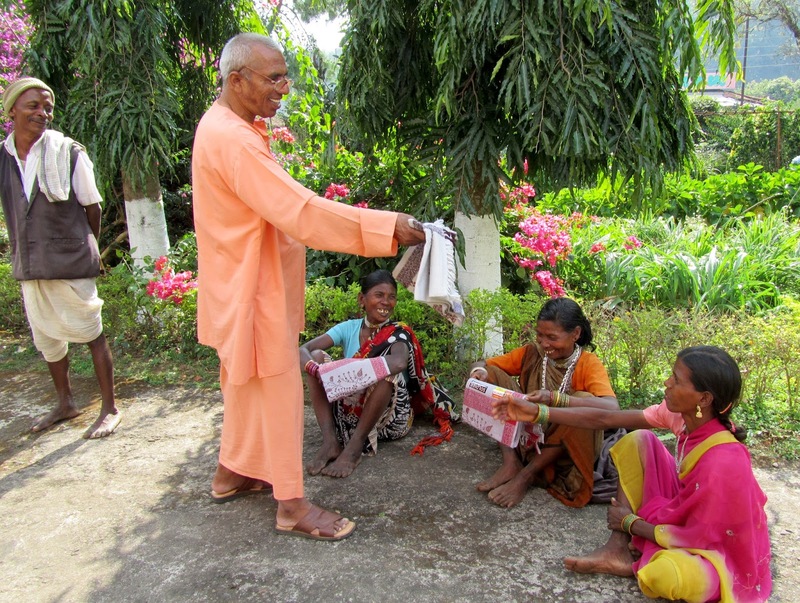 Not only children but tribal women also come and receive provisions and chadders. I learned that Swami himself makes frequent trips to a wholesale place in Bilaspur - a treacherous 5-hour trip over a terrible road – where he purchases colorful sweaters, dresses, pants, school bags, pencils and pads for the tribal children. At night, I heard angry shouts that broke the serenity of the flowing Narmada. “The tribal men get drunk and then get abusive,” said Jayram Maharaj. Fights break out, and the drunken, upset men often leave their families. Crammed into ramshackle houses, women have to bring up their children alone, scratching together meager means. A large percentage of the children who frequent the ashram in the afternoon grow up without fathers. So many questions came to my mind. How did all of this happen? How did these tribal people, who had lived harmoniously for thousands of years in the forest, come to be in such a lowly condition? As I pondered these questions, I was reminded that indigenous people worldwide have been living under threat. The emphasis of their ideology is different from that of modern Western thinking. They consider the ground on which they stand to be sacred. Their connection to their land kindles a deep reverence to nature – springs, rivers, mountains, forests, plants and animals. Their relationship with nature weaves a rich and complex tapestry of culture. The Earth is alive and feels what we do to her. In the Bastar region of Chhattisgarh, for instance, tribal people still prefer to use wooden ploughs because they believe iron ploughs will hurt the earth. In stark contrast, modern society values global capitalism which cares more about power and shareholder profits than about protecting natural resources. “You’ve been trying to instruct us to be capitalists ever since you got here,” said Onondaga Faith-Keeper Oren Lyons, a respected Native American elder. “We don’t value what you value." In my quest to find answers, I found my pilgrimage to heaven leading straight into the heart of darkness. Swami Vivekananda often pointed out that the affluence of the West largely comes at the expense of the indigenous people. I, too, share the blame because I am part of this modern culture that displaces native and tribal people, without guilt, in the name of progress and makes them dependent on things they previously never needed. I use consumer products that likely have been manufactured using raw materials obtained by illegal mining that poisons the land of forest dwellers. I must admit I have not paid enough attention to the plight of tribal people. And this plight is not unique to India. Horrific things have been done to indigenous people in North and South America, Africa, Australia, the Philippines and other regions in the world. Adivasis, literally meaning ‘original inhabitants,’ is an umbrella term for the more than 600 distinct tribes that live in the jungles and hills of India. They have to fight today for the right to live on land they have called home for centuries. These Adivasis don’t understand the modern land ownership system of parcels and titles. They have always lived there. So the land belongs to them. How can you buy or sell the sky? How can you buy the warmth of the land, the freshness of air, or the sparkle of water? The government tells them that their land does not belong to them and regularly forces them to leave, thereby threatening their survival. The government calls Adivasis “Scheduled Tribes,” a term for people formally acknowledged by national legislation. These are the people that modern “progress” has left behind. Amarkantak is in Madhya Pradesh, and looking across a gorge, one can see the state of Chhattisgarh, home to perhaps the largest and oldest tribal communities in central India. 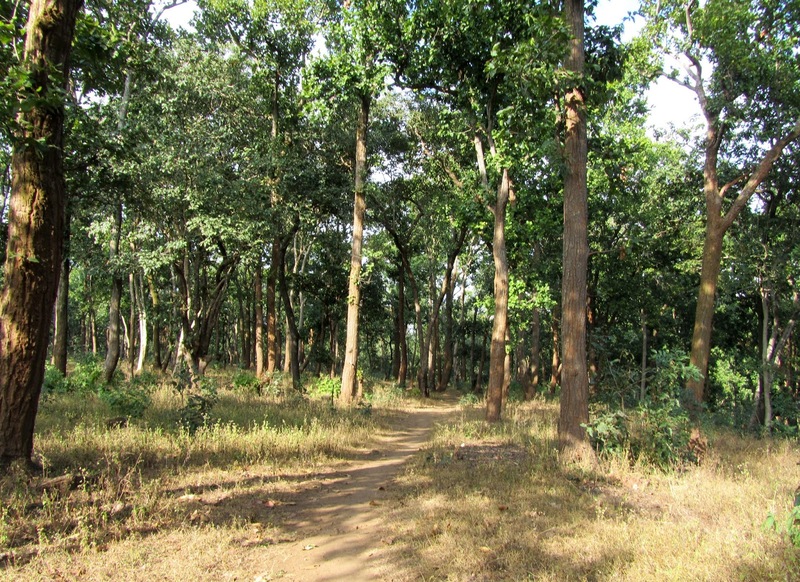 Chhattisgarh is among the greenest states in India with 44 percent of its total area forested and contains diverse flora with more than 80 species of medicinal plants. This land is blessed with beautiful and rugged mountain views, deep gorges, dense forests and wild flowers. A variety of wild animals roam the country – bears, tigers, deer, monkeys, birds, wild boars, panthers, snakes, wild dogs, hyenas and crocodiles. There are many wild bee hives and giant ant hills reaching up to twelve feet high. 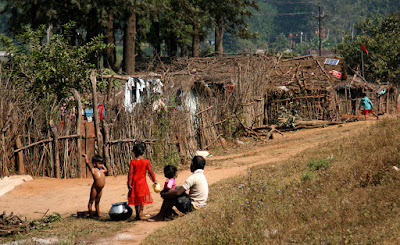 In spite of this abundance and beauty, Chhattisgarh is among the states with the lowest standards of living in India. Poverty is widespread. More than half of the rural and urban tribal populations are extremely poor. They were pushed into poverty, never making a transition to the modern way of life. The largest tribal communities in central India are Gonds and Gond subgroups who have a population of over four million, according to a recent government study. 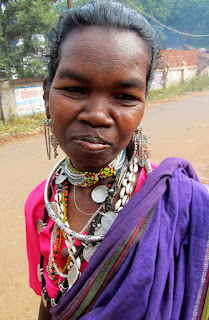 Gonds are predominantly Hindus and like to live in groups in the forest or in small villages. They are famous for handicrafts made from bamboo, cane and metal. Tribal people were the first metal smiths in India, and they still continue to forge and hammer metal using age-old processes. Besides known for creative handicrafts, they possess a special skill in theiir knowledge of medicinal plants which has been handed down through generations. Opinions differ on the origin of the Gonds. Some scholars believe that they came from the South of India while others believe that their origins lie in the area around Amarkantak. A Gond legend traces their origin to Lingo Pen, who later became known and worshiped as Badadev. One day an artist awoke in the mind of Badadev who created various creatures and humans from the filth he found on Badadev’s body. The Gonds love to tell stories. They are very creative and fond of poetry, riddles, dancing and singing. Gonds have learned to keep to themselves because some of their traditions are controversial to Hindu society, attracting the attention of tourists and scholars. They have a practice called ghotul in which unmarried teenagers live together in a dormitory for some time, allowing them to select their mate and gain experience for setting up a household. Divorces and widow remarriages are common, but adultery is strictly forbidden. A sub group of the Gonds are the Baigas, who mainly live in the dense forest and hilly regions of Madhya Pradesh. They consider themselves servants of the Earth and kings of the forest. They perform priestly worship services. Before sowing season, Baigas often perform soil worship for the Gonds and other tribes. They also prepare seeds for them. Baiga women are fond of tattooing. Another important tribal community are the Bheels, who are mostly spread throughout Madhya Pradesh. Bheels consider Eklavya of the Nishada tribe to be their ancestor, and they are regarded as a warrior caste. The Mahabharata tells the story of Eklavya wanting to study archery from Dronacharya but was denied because he belonged to a tribe. Deeply hurt, Eklavya returned home with a resolve to master archery. He created a mud statue of Drona and, before the image, began a disciplined program of self-study over many years. He developed into an archer of exceptional prowess. Other major tribal groups are the Bhatras and Dhurvaas. They live in the Bastar and Raipur regions of Chhattisgarh. Bhatra women enjoy a high status in their society. Bhatra girls have full freedom to choose their husbands. In the Dhurvaa tribe, women also enjoy a high standing and are responsible for most of the family maintenance. Dhurvaas make their living through agriculture, hunting, selling handicrafts made with cane and gathering forest products. Their festivals involve animal sacrifices to propitiate their village goddess. Tobacco and an intoxicating liquor made from mahuva flowers are a must for such celebrations. Trees are sacred in tribal communities, especially the mahuva tree, which is also known as the “Butter Tree.” Tribal people worship this tree as the home of Baba Goraknath. It is sacrilegious to cut it down. Mahuva trees have large thick leaves and scented, sweet-tasting, pulpy flowers that grow near the ends of the branches. These flowers can be dried and preserved and used as food. The seeds from the fruit are rich in oil that is used for cooking and for making soap. Mahuva liquor is also used by the Abujhmar tribe, who live deep in the forests in Narainpur Tehsil of the Bastar districts in southern Chhattisgarh. Since they live in isolation and avoid contact with outsiders, they have retained much of their customs, traditions and values. They hunt with spears and arrows and cultivate land without ploughing the Earth, lest they inflict pain on her body. They protect tigers from poachers. Although regarded as less civilized than other Gonds, they far surpass them in strength and ability. They have a strong sense of community and value equality and brotherhood. Each tribal group has its own rich and distinct culture, its own dialect, dress, eating habits, and rituals. What is common among tribes is the simple and natural way of life that has changed little over centuries. Marriages tend to take place within the tribe. Festivals involve group dances. Participants wear colorful costumes, ornaments and bright headgear made of beads, shells, bones, feathers and mixed metals. 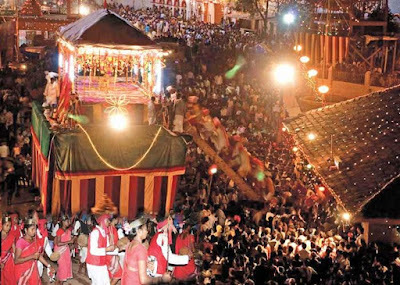 Each tribe has its own festivals, but all major tribes show up at the Bastar Dassera festival at the Devi Danteshwari temple, near Jagdalpur. 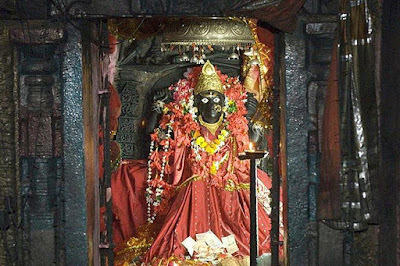 This temple is considered one of the fifty-two Shakti Peetams. The Bastar Dassera festival is worth mentioning in more detail. Beginning on the new moon in the month of Shravan, Bastar Dassera lasts over 75 days and ends on the thirteenth day of the bright moon in the month of Ashwin. 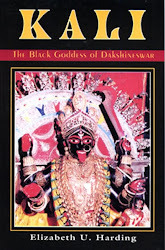 The focus of the festival is Devi Maoli and her sisters. Devi Maoli is Bastar’s native deity, revered as the elder sister of Devi Danteshwari, the family goddess of the ruling Kakatiya family. Though the festival has its roots in Hinduism, it has assimilated many tribal elements. Bastar Dassera involves the participation of diverse tribes, each of whom is assigned a specific task. Tribal carpenters come from the Beda Umargaon village to build a two-tiered chariot, and tribal villagers from Karanji, Kesarpal and Sonabal gather to twine the massive ropes that pull the chariot. During the festival, young tribal members from Kachorapati and Agarwara pull a smaller chariot while the larger chariot is pulled by Maria tribal members from Killepal who wear bison-horned head dresses. The task of singing hymns at all rituals is the job of the Munda tribal members from the Potanar village. A chosen tribal girl gets assigned to swing on a bed of thorns during the festival, and a young tribal man is designated to hold vigil for nine days while buried shoulder-deep. 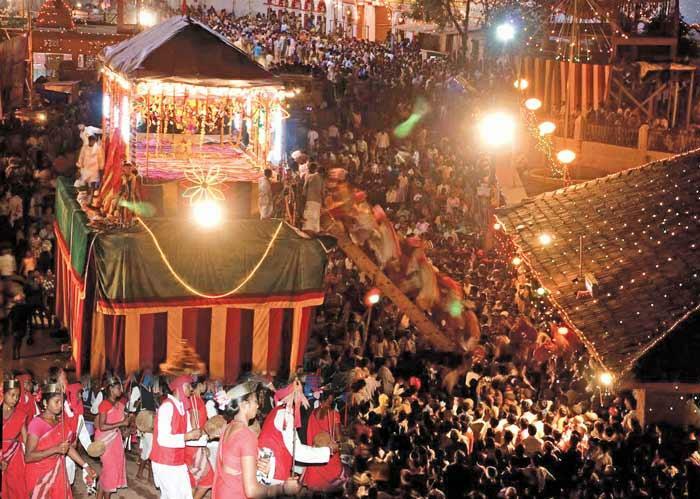 One of the most awaited events during Bastar Dassera is the ratha yatra. An outsider may consider these chariots primitive but they are made with great pride. The festival starts with the worship of the wood that will be used to build the chariots. Only ancient tools are used. Modern tools are taboo. When one sees these chariots pulled by over 400 Maria tribal members - who usually live in isolation in the dense forest - one gets a powerful visual of tribal faith and ingenuity. Haat bazars are another occasion for tribal people to socialize. These are weekly markets in rural areas where people go to purchase supplies for the week. The Amarkantak haat bazar is held Sunday afternoons between 3 and 5 pm near the Narmada Devi temple on a vacant lot where large yatra buses normally park. Villagers sit on the ground and display their produce on a cloth spread out in front of them. You have to bring your own bag to carry the produce. Jayram Maharaj had asked me to purchase vegetables since he was planning a bandhara (feast) the next day. I had great fun pushing through the crowd and purchasing fresh vegetables and fruit for the cook at the Ramakrishna Kutir, but I did not bargain. Seeing the poverty of the villagers, I gave them the price they asked for. To understand the cause of why tribal people are passing through a difficult time, one needs to go back to the early 20th century. At that time, the government opened many tribal regions to non-tribals who received free ownership of land in return for cultivating it. Tribal people never had formal land titles for their ancestral land, and by the time they understood that they needed these, they often lost the opportunity to lay claim to their land. The British and post-independence regimes belatedly realized the necessity to protect tribal communities from outsiders and prohibit the sale of tribal lands. By the 1970s, many tribal peoples had lost their land. Outsiders simply squatted on their land or lobbied governments to classify them as tribal. 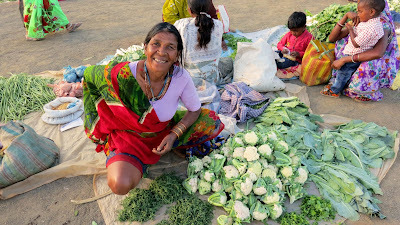 A resident non-tribal shopkeeper became a permanent feature in many tribal villages, often selling goods on credit and demanding high interest. Many fell so deeply into debt that they had to mortgage their land. Government policies on forest reserves equally affected tribal peoples profoundly. Exploitation of forests has often meant allowing outsiders to cut large areas of trees while the original tribal inhabitants were prevented from cutting. 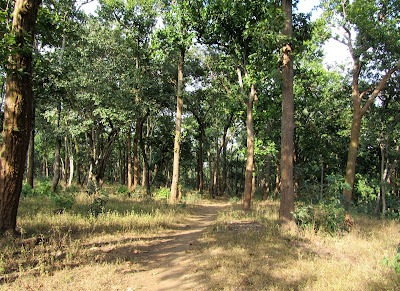 Tribal people in Bastar had ownership rights over the trees on their land for centuries. A wide-spread scam in the 1990s allowed timber merchants to buy tribal lands, leading to large-scale felling of trees. 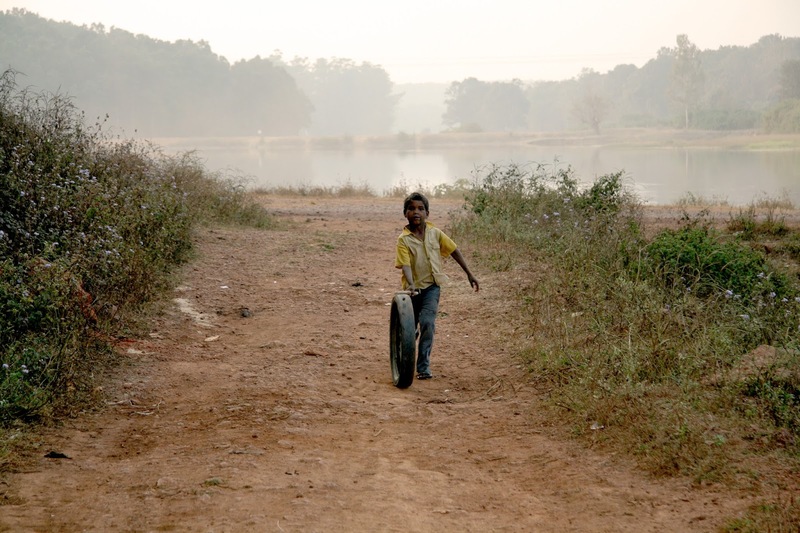 In Amarkantak alone, the forest has been decimated since Jayram Maharaj arrived 35 years ago. “When I came, the jungle around the ashram was thick,” he said. India needs more energy, and Chhattisgarh is the main source for India’s electricity and steel. Tribal communities lost hundreds of thousands of hectares of forest land due to dams on the sacred river Narmada. A recent mega steel plant project worth Rs 18,000 crore in the Dantewada District has drawn much opposition from tribal members in the area. The Steel Authority of India said that this plant will provide employment and pave the way for development. Tribal people are proud of the way they live. They do not want charity, just the right to live their lives on the land they have called home for centuries. An indigenous person without land is no longer indigenous. Tribal people want development in terms of colleges and vocational training. Currently, there is only one tribal university in India. It is located in Amarkantak and was established by the Indira Gandhi National Tribal University Act in 2007. Fully funded by the Government of India, this university was started to give tribal students access to higher education. Regional campuses aim to preserve tribal art, culture and knowledge of medicinal plants. Poverty and illiteracy have made tribal people fair game for powerful parties. On one side, the Government is actively trying to recruit tribal members into their paramilitary force, and on the other, the Naxal Maoists have also tried to recruit them. 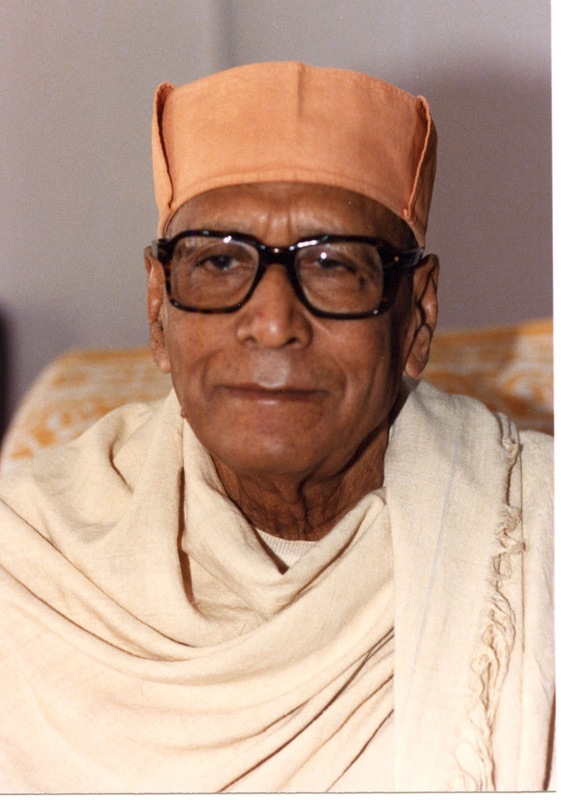 Jayram Maharaj told me that Swami Atmananda did not initiate, but I could see his influence in the great work being done quietly at the Amarkantak ashrama. There was much on my mind when my pilgrimage to Amarkantak ended and I returned to America. I learned that I should be more conscious of where I put my values, and with sensitivity and tenderness, I should build deeper relationships with people and the land on which we live. Our sisters and brothers in the forest need help.